Party of one? 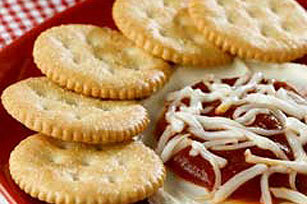 By all means, dip into this pizza-inspired deliciousness, made with cheese and pizza sauce and served with crackers. Spread reduced-fat cream cheese into 3-1/2-inch circle on microwaveable plate; top with sauce and mozzarella. Microwave on HIGH 15 to 20 sec. or until heated through. Substitute pasta sauce for the pizza sauce.